Research has shown that children, even babies, have experienced depression. In the United States alone, research studies suggest that up to one percent of babies, four percent of preschool-aged children, five percent of school-aged children, and eleven percent of adolescents meet the diagnostic criteria for Major Depressive Disorder. It is important to understand the risk factors and symptoms of childhood depression to help your child receive the necessary therapeutic interventions. Suicide is the second leading cause of death for children, adolescents, and young adults aged 10 through 24 (http://jasonfoundation.com/prp/facts/youth-suicide-statistics/). Suicide is significantly linked to depression, so early detection and diagnosis is critical and sometimes even life-saving. Just like adults, children are capable of changes in mood, expressing negative thoughts, but are more likely to show depressive symptoms in behavioral ways. For example, a child experiencing depression may complain of fatigue, stomach aches, headaches, or experience irritability, changes in appetite, and changes in sleep patterns. These physical symptoms, often known as somatic symptoms, are expressed physical aches and pains that are real experiences for your child, although they have no known medical causes. These somatic complaints are often common in children who experience depression. It is important to rule out physical illness or other medical problems with your pediatrician if your child is experiencing these symptoms. Parents are a child’s greatest advocate and support, so it is important to know what to do to help your child if you suspect that he or she is struggling with depressive symptoms. Talk about depression with your child. Support and encouragement through open communication help your child feel comfortable to express his or her feelings. This lets your child know that he or she is not alone, is loved, and understood. Talk with your child’s pediatrician. Mental health is just as important as your child’s physical health. If you notice your child is experiencing symptoms of childhood depression, call your pediatrician to alert him or her of your child’s emotional concerns. Your pediatrician may recommend a diagnostic screening or refer to an outpatient licensed therapist. Don’t ignore it! Depression is a serious mental illness that cannot be brushed aside or ignored. Ignoring your child’s emotional concerns will not help your child obtain the treatment that he or she needs to overcome depression. Depression is a treatable illness with success rates of up to 80% for children and adolescents who receive therapeutic intervention. The other 20% may respond well to medicinal interventions along with traditional therapy (https://blogs.scientificamerican.com/mind-guest-blog/what-adults-need-to-know-about-pediatric-depression/). Recommended treatments include play therapy, family therapy, and individual talk therapy, including cognitive behavioral therapy (CBT) that helps children re-frame their negative thinking patterns to help them change their self-perception and consequently, improve their mood. Cognitive behavioral therapy is goal-oriented, problem-solving focused, and is one of the most commonly used interventions to treat depression. Medicinal options are another commonly used treatment for children who experience depression, with the goal of reducing depressive symptoms. The majority of children who take antidepressant medications will be able to stop their medication with support from their pediatrician or psychiatrist when their symptoms improve. It is important to note that the use of antidepressant medication for children and adolescents may carry a higher risk for suicidal thoughts for this population. It is imperative to receive ongoing medication monitoring to assess risk of side effects and other interactions. I Think My Child is Depressed. What Should I Do? 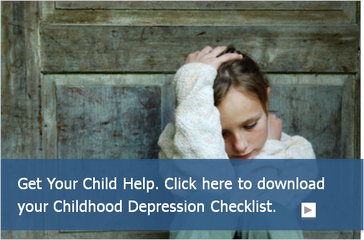 If you suspect that your child may be experiencing depression, it is recommended that you contact your pediatrician. Share your concerns and plan for a medical evaluation to begin the diagnostic process. If medical testing shows no other reason for the fatigue, stomach aches, headaches, sleep, appetite changes, or sadness that often come with depression, a licensed mental health professional will evaluate further to determine the most appropriate treatment plan. If you have a preteen or teen child, you probably have heard of the hugely popular Netflix show 13 Reasons Why. The show, based on a best-selling novel, centers around Hannah, a teenage girl who dies by suicide and leaves behind tapes to the people she feels pushed her towards ending her life. This popular and controversial show has brought in discussions about mental health, bullying, sexual assault, substance use and suicide. As a counselor, I agree that raising awareness on these topics is crucial and necessary, especially considering the frightening increasing rates of these issues. However, I am concerned about the potential impact that this show might have on young teens. Teenagers are very vulnerable to graphic content. The show can be hard to watch, and some scenes can be potentially very triggering. Many teens are binge-watching the show, which increases concern about the possible emotional distress that can be caused by doing so. I do not recommend that anyone struggling with suicidal thoughts watches the show as it might develop potential ideas or even romanticize the idea of suicide. The problem with the ultimate fantasy is that the character does not get to change her life with suicide nor does she get to find out what happens next. Suicide is final. 13 Reasons Why also misses the mark in its failure to address mental illness or depression ( the most common risk factor in completed suicides). Depression can look differently in teens than adults. Loss of interest in sports, hobbies, etc. My recommendation is that if your child wants to watch the show, you watch with them. Talk to your children about bullying and what it might look like. Bullying can be physical or verbal abuse, excluding others, or using the internet/social media to attack and humiliate the victim. Teach your child to not be a bystander or support bullying. Talk to your child about resilience and options on how to reach out for support if they are being bullied. If children develop resilience and strong self -advocacy, it can help them further develop their self- esteem and instill courage. Talk to your child about symptoms of depression. 1 in 5 teens experience depression and suicide is the third leading cause of death among 15-24-year-olds according to the CDC. Discussing the issue of suicide does not plant the idea. It creates the opportunity to offer help. Have a conversation with your child about trusted adults in their life that they can reach out to if they need help. Listen to your child’s comments without judgment. Do not minimize or trivialize what you see. If it appears insignificant to you as an adult, remember that this is a daily reality that teens are faced with each day. Allow your child to discuss any issues without judgment or punishment. We need to use shows like 13 Reasons Why as a reminder. A reminder to be emotionally present and let children know that they are loved and supported. Children need you to be their secure base, to support their exploration, help them, enjoy with them and watch over them. Make sure to create a space for listening that is nonjudgmental and supportive. If you need to talk, or if you or someone you know is experiencing suicidal thoughts, call the Suicide Prevention Hotline 1800-273-8255 or 1800-SUICIDE (784-2433). How Can Virtual Therapy Benefit Teens? Teens in general feel very comfortable with the virtual world. Many of their homework assignments are turned in virtually, and much of their social communication is done virtually. It makes sense that Virtual Therapy (also known as Tele Therapy) can be a comfortable and productive way to help support a teen with their many pressures. For a teen who may be resistant to regular therapy, Virtual Therapy is a great way to help him get used to the therapeutic relationship and to help him see how it could benefit him. Through Virtual Therapy, a teen can learn how to deal with his busy life by having a safe, comfortable place to share and solve problems. https://nspt4kids.com/wp-content/uploads/2015/12/teenfeatured.png 186 183 Jonathan Levin https://nspt4kids.com/wp-content/uploads/2016/05/nspt_2-color-logo_noclaims.png Jonathan Levin2015-12-30 09:21:332016-01-11 08:20:07How Can Virtual Therapy Benefit Teens? Today’s guest blog by Stacey Porter, founder of the Tangerine Owl Project, discusses maternal mental health after the loss of a child. ago I lost an infant daughter who was born at 25 weeks gestation due to preeclampsia. That was a profoundly impactful life altering experience, and it’s made me a different person. I learned to cope, gave myself permission to grieve, and began to shape that experience into a way that I can help others in my community who are suffering through the trauma of the NICU and/or child loss. Since then, I have started to become very in tune with the amount of pain, devastation, confliction, perseverance and hope out there for these parents. I have witnessed and talked through the anxiety and depression that looms over these mothers like dark ash and exhaust from a fire that doesn’t allow one to take a breath. I have seen how these losses can both defeat them and strengthen them all at the same time. I can’t explain how that’s possible, but it happens. The thing is anxiety and depression aren’t just happening for those mothers who have experienced a trauma or loss, or even post-partum depression. Maternal mental health issues effect 1 in 8 mothers out there. That is a shockingly high number, yet these issues seem to fly under the radar so well. How is that possible? I can count right now, out of the number of women I know simply through my social network and family which would mean that at least a handful of them may be experiencing this (or have at some point) that I was/am completely unaware of. How are we supposed to support the mothers who are struggling if we don’t even know they are struggling? I have dealt with acute depression just out of college with all the transitions happening in my life, it was too much, too fast, and I was struggling to adapt to them all. This was situational for me and I was able to find my way out of if with the help of counseling and some short term meds, but that doesn’t stop me from wondering if It’ll come back again later. In fact, I’m actually pretty surprised that the loss of my daughter didn’t throw me into a well of despair. Don’t get me wrong, I grieved….hard….. but there is a difference between grief and depression. I have long advocated for mothers to share their stories and their grief when they suffer loss, because knowing they aren’t alone in their feelings and that how they feel is absolutely OK, no matter what those feelings are. They are theirs and they are justified. It’s not surprising that this simple act works wonders in their processing of their emotions and figuring out how to work through them in rebuilding their lives. That holds true for mothers as well. Much like trauma and loss, anxiety, depression and other disorders that effect mental health are not picky on whose life they descend and wreak havoc. So why the stigma? When can someone share that they are struggling more than normal and not get chastised or written off for it? Why is it not ok for a mother who seemingly has everything to struggle with getting out of bed in the morning? Why does it take an extreme of a mother on the news who drowned her children to call attention to mental health? Mothers struggle with these disorders. Every. Single. Day. So, why can she not open up to her friend and say, you know, this is a really terrible day and I am not quite sure if/how I will make it through..Maybe she can, and maybe she did. But are we listening? When others say these types things to them, it further invalidates their feelings so they are less likely to either realize that there truly is a problem or feel like their feelings are not appropriate. There is a fine line in determining what is actually going on in someone’s head and how to respond to any of these statements, that’s what the professionals are trained in and there for. What WE can do, is be a human being. In general, it seems that people have such low tolerance and patience they don’t see all the work that is needed to combat these feelings and move through life. Some do a very good job of hiding it and the smile masks all the chaos going on in their minds. For many it is a daily battle, and we need to be wiser, we need to be more patient, and we need to be open. Many of us are not in the business to offer professional mental health counseling to the women in our lives that struggle, but all of us are certainly able to have a conversation with our friend, our sister, our co-worker, the mom to one of our kid’s friends, etc. Much like helping a bereaved parent, you don’t have to understand what they’re going through to be able to help them. You don’t have to fix someone’s problem for them, you just have to be there to listen should she decide today is the day she opens up to someone the real answer to that question “how are you doing?”. Sit with her on the floor as she cries. Let her talk about her fears, celebrate the small winnings of the day if you recognize it took a tremendous amount of effort to accomplish for her. It may take more than a friend to help her through, but being there to listen will certainly go a long way. For far too long, there has been an undeserved stigma associated with mental health, so if you are dealing with it please don’t keep it to yourself. 1 in 8 there is likely someone right alongside of you that is sharing a similar struggle. For those of us who are lucky enough not to be struggling with this, don’t halt the conversation if it starts, and pay a little extra attention. Depression and anxiety are called “invisible” illnesses. Are they invisible because they are hidden so well or are they invisible because we refuse to see them? Are you concerned that your child is demonstrating symptoms of an eating disorder? There are many common misconceptions when one evaluates for the presence of an eating disorder such as the person needs to “be skinny,” “be female,” and “be obsessed with food and calorie counting.” Although these can be factors, eating disorders are an equal opportunity affliction and can affect individuals across size, shape, gender, race, and age. Eating disorders are indicative of a person’s unhealthy relationship with food and his or her unrealistic expectations for weight that negatively impacts the individual’s overall quality of life. Although food is a primary component in the diagnosis of eating disorders, the food itself is a maladaptive tool to cope with a range of emotions and can serve as a false method for power and control. What are some symptoms of eating disorders? Eating disorder treatment includes individual and group psychotherapy to gain strategies to become aware of and avoid maladaptive behaviors, challenge negative core beliefs about weight, and enhance self-esteem. Additionally, nutritional counseling and medication management for the treatment of the underlying depression or anxiety can be added as needed. https://nspt4kids.com/wp-content/uploads/2015/02/Eeating-Disorder-2-FeaturedImage.png 186 183 Ali Swillinger https://nspt4kids.com/wp-content/uploads/2016/05/nspt_2-color-logo_noclaims.png Ali Swillinger2015-02-11 05:32:152015-02-11 05:32:15Does My Child Have An Eating Disorder? How can you tell the difference between your child just having a rough day or week versus a more serious mood issue? We all have the occasional bad day, but when a child’s mood or behavior changes so significantly that it begins to interfere with their overall quality of life, depression may be present. For example, if your child has previously loved school and valued completing homework and now has become resistant towards going to school and failing to complete assigned tasks, this would be a red flag that something deeper is going on with your child. Your child does not need to meet every criteria listed above in order to meet depression diagnostic standards. If depressive symptoms are present for at least 2 weeks, it is important to contact your medical and/or mental health care provider. Factors that may contribute to depression include family history of depression, interpersonal conflicts, or life event changes. The good news is that depression responds to mental health treatment. Cognitive-Behavioral therapy alters the ways in which a child views the world. Children and their therapists can address underlying messages and assumptions that the child has about him/herself and the world in order to re-create a more positive and realistic framework from which to function within. Depression is more than just feeling sad; it is a low-mood state that affects all aspects of daily life and functioning. occasional bad day, but when a child’s mood or behavior changes so dramatically that it begins to interfere with their overall quality of life, depression may be present. For example, if your child has always enjoyed school and valued completing homework, but now has become resistant towards going to school and failing to complete assigned tasks, this could be a red flag that there is something deeper going on with your child. Your child does not need to meet every criteria listed above in order to meet depression diagnostic standards. If depressive symptoms are present for at least 2 weeks, it is important to contact your medical and/or mental health care provider. Factors that may contribute to depression include family history of depression, interpersonal conflicts or life event changes. The good news is that depression responds to mental health treatment. Cognitive-Behavioral Therapy alters the way in which a child views the world. Children and their therapists are able to address underlying messages and assumptions that the child has about him/herself and the world. Addressing these underlying messages and assumptions will help the child re-create a more positive and realistic framework from which to function within. Depression involves more than sadness; it is a low-mood state that affects all aspects of daily life and functioning. In today’s Webisode, a pediatric social worker provides some useful tips to help a stressful teen. In today’s Webisode, a licensed social worker gives us 3 signs to look out for when it comes to childhood depression. Announcer: From Chicago’s leading experts in pediatrics, to a worldwide audience, this is Pediatric Therapy TV, where we provide experience and innovation to maximize your child’s potential. Now, your host, here’s Robyn. Robyn: Hello, and welcome to Pediatric Therapy TV. I’m your host, Robyn Ackerman, and I’m sitting here today with Ali Wein, a licensed professional social worker. Ali, can you give us three things to look out for inchildhood depression? Ali: Absolutely. The main thing we really want to look for is any sort of deviation from typical behavior. So the first thing we want to note, are there any changes in eating or sleeping patterns? If your child usually wakes up really early in the morning and they fall asleep really early at night, and all of a sudden they’re having a harder time falling asleep at night and they’re requiring more hours of sleep per evening, this might be indicative of something greater going on underlyingly. Additionally, any changes in the eating habits. Are they eating more? Are they eating less? Are they rapidly gaining and/or losing weight? Things that aren’t just sporadic, but you’re noticing changes in patterns of behavior. Another thing we want to look for is disinterest in previously enjoyed activities. So if your child really loves soccer and can’t wait for Tuesdays when they get to wake up in the morning and practice with their soccer team, all of a sudden they’re crying. They don’t want to go. They’re coming up with excuses because they just don’t want to go to soccer. That might be indicative of something else going on as well. Finally, we also want to pay attention to any sort of change in personality, mood, and affect, affect being the way that we present ourselves. So if your child is typically really easygoing, calm, relaxed, and now all of a sudden they’re having trouble communicating, maybe, they’re a little bit more spaced out and more inattentive, they’re more easily to get angry and have outbursts, this might also be indicative of childhood depression. Robyn: All right. Thank you so much for letting us know those three signs. Thank you to our viewers, and remember, keep on blossoming.